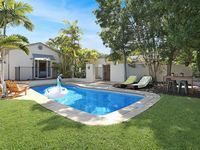 Properties in Noosa North Shore average 4.6 out of 5 stars. 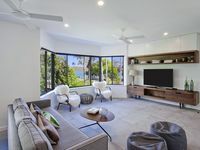 Spacious Noosa beachhouse - where the forest meets the sea - with heated pool! Property 40: Spacious Noosa beachhouse - where the forest meets the sea - with heated pool! Walking distance to Hastings Street & main beach, stunningly furnished!! Property 41: Walking distance to Hastings Street & main beach, stunningly furnished!! Spacious, well equipped modern home. We were really impressed with The Shack. Spacious and really comfortable living areas. Comfortable beds in a lovely quiet house. Big pool, and a couple of outdoor areas. There is an off leash dog park in walking distance, with cricket nets and a playground. A great spot for family get away.